Viotek GN32LD Review | Nerd Much? It really takes a lot to impress me when it comes to monitors. After all — they’re typically intended to have smaller screens because they’re right in your face, making the necessity for ultra high resolutions virtually unnecessary. A “good” HD monitor purchased in the last five years in the same price range will mostly look similar if not identical to any other “good” HD monitor on the market. But when you start to get to the bigger screen sizes, you’ll start to actually notice the differences between a good monitor and a bad one because you can actually start to see all of those pixels. At 32″, you should be able to see a clear difference between a 1080p monitor and a 1440p one, and if you can’t, you should probably look for a different 1440p monitor. 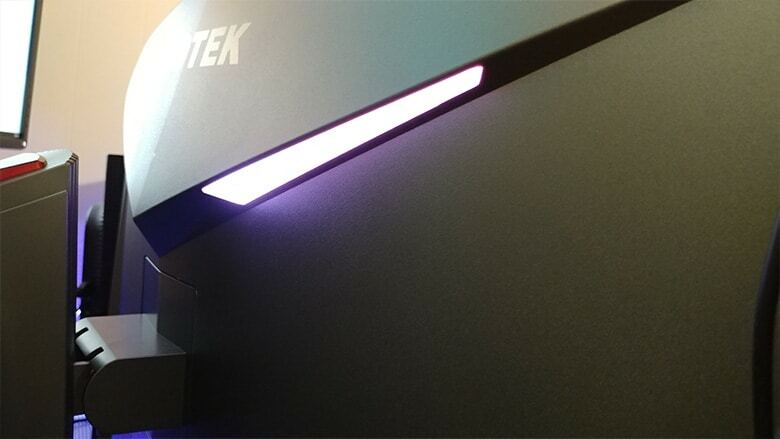 Now, if you’re like us, you probably haven’t heard of Viotek just yet; it’s a relatively unknown gaming monitor brand that aims to make high-performance gaming displays more affordable. Luckily, Viotek sent us one of their latest models, the Viotek GN32LD (which you can find on Amazon here), for reviewing purposes, and we mostly have good things to say about the brand. The GN32LD is our first experience with anything Viotek-related, so we’re coming in with an entirely fresh and unbiased perspective. And, honestly, there’s a lot to love about this curved gaming monitor. First, and most importantly, is that the picture looks great. With the right picture settings, colors are vibrant, the refresh rate makes gameplay incredibly smooth, and the blacks are well-presented. And, the fact that it has a curved screen makes your first person games especially feel that much more immersive. And because of this monitor’s 31.6″ screen, there’s a lot of real estate for your eyes to take in while you’re gaming. While in the heat of a match of PUBG, I was able to see smaller details that were far away (meaning I was actually able to tell the difference between distant foliage and a player crouching without having to pull up a scope — awesome!) with great clarity. Anyone who has ever played PUBG can tell you that they frequently have to pull up their scope to tell whether what you’re looking at is a poorly-rendered bush or another player aiming down his sites, and with this 31.6″ Viotek gaming monitor, a lot of the guesswork was eliminated. The Viotek GN32LD has five display presets that are easy to select, so whether you’re looking to spend hours playing Realm Royale for your Twitch viewers or you want to binge the latest season of Stranger Things, you can easily select the one that’s best for you. I’ll also note that this monitor can be very bright, which is obviously great for gaming and movie viewing. However, if you’re planning to use it for daily use/work purposes, you’ll lower that brightness down quite a bit (I currently have mine set all the way down to 11 out of 100 while typing this review). Secondly, the look of the monitor, itself, is impressive to behold, and if you’re the boisterous type, you’ll love showing it off to your friends. It sports a gunmetal silver and crimson red colorway you’ll find in many other PC gaming accessories on the market in 2018, and it has all of the right curves and edges in all the right places to give it a modern look. On the back of the monitor, you’ll find two medium-sized LED lights that can be set to a handful of different colors and a few different settings. They add a nice design touch to it, especially if you’re an LED-enthusiast like myself. I’ll also note that the monitor has an ultra-thin frame, so it’s a great option for dual monitor setups. On top of that, it has an adjustable stand that can not only move vertically but can also tilt up and down slightly. I tested this model with my Xbox One X as well, which is now also FreeSync compatible. Forza Horizon 3 looked absolutely stunning on this monitor, and if you really want to appreciate a smooth framerate and the vibrant colors that this Viotek gaming monitor can display, I highly suggest testing it with a colorful game like Forza Horizon 3. While we have mostly positive things to say about the Viotek GN32LD curved monitor, it does have a few minor caveats. Our biggest gripe with the Viotek GN32LD is that its legs take up a lot of space on my desk (which, for the record, is average to large in size). 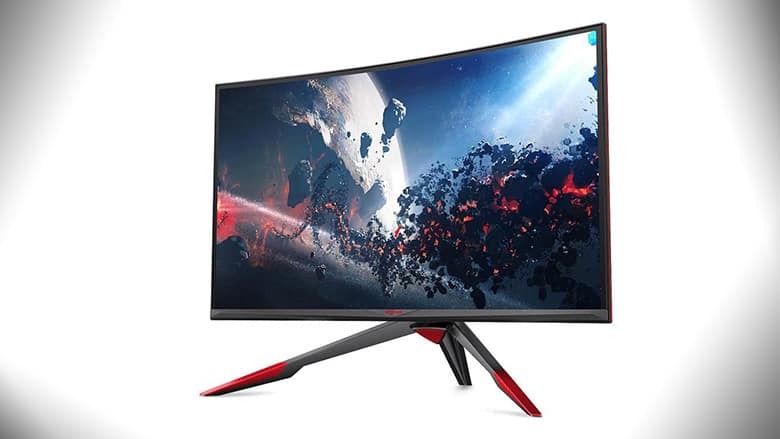 Of course, the argument can be made that because it’s such a big monitor it needs a wider base to support it, but I think Viotek might have made the legs longer than they needed to be. Luckily, it comes with screws for a standard Vesa mount, so you can get rid of the stand altogether if you want to mount it. Our second issue actually stems from those LED lights on the back of the monitor, which could have actually been much more useful than they are. Despite the monitor’s impressive brightness, the lights on the back of the monitor actually aren’t bright enough to serve much purpose other than being slightly cool-looking. On all of my other monitors, I have LED strips to provide bias lightning, but with the Viotek GN32LD model, those lights on the back just aren’t bright enough to serve that purpose. It’s not a deal-breaker by any means, especially when you factor in the price in comparison to Viotek’s competitors. I’ve always been the type to be a bit skeptical of unknown brands, especially when it comes to my gaming rig. I’ve been burned too many times before by “taking the cheap route”, as my wife can attest. But Viotek quickly calmed my skepticism (mostly caused by its low-price in comparison to its competition) with its quality. The monitor’s various setting and options make it surprisingly versatile, and whether you’re planning to game all day or type up gaming monitor reviews like this one, you can find the settings that work best for your task easily. The entire 16.1 million colors in its profile are brilliantly displayed, and if you’re a designer of any kind, you’re going to appreciate how true to color it is. Image quality is crystal clear in full 1440p, and the 144hz refresh rate paired with the Freesync capabilities helps make your games look smoother. If you’re okay with having a large stand or mounting it, the Viotek GN32LD is a great option when you’re looking for a gaming monitor to add to your setup — and we don’t just mean a budget gaming monitor, either. At $200 less than the ASUS Rog Strix (probably its closest true competitor), the Viotek GN32LD is a steal. From skeptical to an enthusiastic yes after just one week with the thing.